Thousands of Victorians are experiencing power outages after the Australian Energy Market Operator (AEMO) directed load shedding across the grid on what is forecast to be Melbourne’s hottest day in a decade. Load shedding occurs when demand is too great, so the energy operator directs power companies to create rolling blackouts in different parts of the network so the entire system is not at risk. AEMO chief executive officer Audrey Zibelman said the power outages would affect about 60,000 customers for up to two hours. “Hopefully what we’ll do is we’ll see it through, it will be for a temporary period of time, they’ll restore it,” she said. Power company websites reported more than 64,500 customers had been disconnected from power across the state about 12:45pm. The Victorian Government had said earlier it was not anticipating load shedding to occur despite the huge demand for power. Earlier in the day AEMO activated emergency reserves, including preparing to pay some businesses to voluntarily curtail their own usage. But those reserves were not enough to cover the shortfall. Victoria is also importing power from South Australia, Tasmania and New South Wales, but cannot import more because interconnectors are at their maximum limits. Power outages are being reported in a number of Melbourne suburbs including Glenroy, Oak Park, Broadmeadows, Essendon and Strathmore. Further north, regional locations including Shepparton, Kyabram, Numurkah and Cobram were among those to experience power cuts. One company sent customers a text message stating that a “PowerResponse event” would occur between midday and 3:00pm “due to extreme weather”. On Ormond Road, the main street of Elwood in Melbourne’s inner south-east, shops and cafes were forced to limit services or close because of the lack of electricity. “It’s gone dark all the way along the main street here,” Elwood cafe worker Sofie said. More than 100 sets of traffic lights also went out across the city, particularly the south-eastern suburbs. The blackouts are occurring as authorities battle an out-of-control bushfire which is threatening homes in the state’s east. An Emergency Warning was issued about 11:30am for a bushfire burning 10 kilometres north of Timbarra, in remote east Gippsland. A relief centre has been set up at the Buchan Recreation Reserve and authorities warned any residents at nearby Gillingall to leave their homes before conditions become too dangerous. “Emergency Services may not be able to help you if you decide to stay,” the warning said. In Melbourne it had reached 41.5C at 1:00pm, and forecasters predict the city’s temperature will keep rising to a maximum of 44C. If that happens, it will be Melbourne’s hottest day since Black Saturday — February 7, 2009 — when it reached 46.4C. The Bureau of Meteorology’s state manager for Victoria, Andrew Tupper, warned the humidity would make it feel even hotter, and urged people to heed the advice of health and emergency services. “It’s not like a regular day,” Dr Tupper said. “This summer is not just a normal summer. 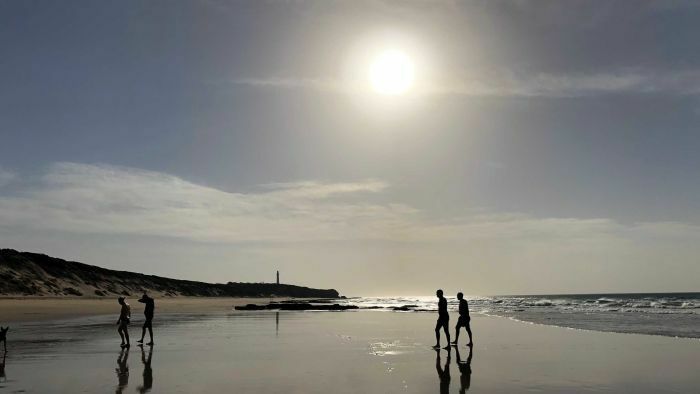 A mass of hot air that had been building over central Australia yesterday brought record temperatures to South Australia, where Adelaide hit a sweltering 46.6C, surpassing Melbourne’s Black Saturday record for the highest temperature in an Australian capital city. As that mass moves across Victoria today, the bureau is predicting it could send records tumbling in north-east Victoria. It is tipped to reach 46C in Shepparton and Echuca. In the state’s north-west, temperatures are expected to reach 47C in Mildura and Ouyen, and 46C in Swan Hill and Kerang. Relief is expected for Melbourne about 3:00pm, with the arrival of a cool change that could see temperatures plummet by up to 15 degrees in 15 minutes. But while the change will reach the state’s south-west in the morning and move across the state over the course of the day, some parts of north-eastern Victoria will not get relief until early Saturday morning. Strong northerly winds ahead of the change, and gusty southerly winds following the change, will also bring elevated fire risk. Construction has ground to a halt in parts of the state, after hundreds of workers on unionised building sites downed tools in the heat. The CFMEU, which represents construction workers, has a heat policy that states work must stop once the temperature hits 35C. More than 160 tower cranes in Melbourne alone have been shut down, according to the union. The Australian Energy Market Operator (AEMO) said it would need to dip into reserve power this afternoon to lower the risk of unplanned outages. AEMO’s chief executive officer, Aubrey Zibelman, said Alcoa had agreed to power down its aluminium smelter at Portland, in the state’s south-west, to ease demand. The smelter is Victoria’s biggest energy user and yesterday reduced its production between 7:10pm and 8:50pm in order to ease demand. “They’ve been extraordinarily helpful to us and they’ve agreed to go off today too,” Ms Zibelman said. She said the move would add an extra 400 megawatts back into the grid, while strong winds were expected to help generate about 700 megawatts of power in the afternoon. However, Ms Zibelman urged consumers to do their part to reduce the burden on the grid by lowering their power use between midday and 5:00pm, when demand is expected to peak. “Think about maybe cooling [your] houses or buildings a little bit more in the morning, then turning up the temperature in the afternoon,” she said. Three of the state’s power generating units in Gippsland remain offline today: two out of four generators at the Yallourn Power Station, and one of the four units at AGL’s Loy Yang A power station. Separately — and unrelated to AEMO’s load-shedding directions —various local outages throughout the state left more than 5,000 households without power for part of last night, while a fault with an underground line left about 2,700 houses without power in central Victoria yesterday. Emergency Management Commissioner Andrew Crisp warned that the extreme weather meant that any fires sparked today would be “uncontrollable”. He said 500 emergency management staff were in place across the state, and 60 planes and helicopters were poised to tackle fires. Commissioner Crisp urged people not to leave children in locked cars in the heat and to download the VicEmergency phone app to stay informed. The State Control Centre said 1.12 million users had downloaded the app, which can be tailored to the user’s location and provides information on fires, floods and other emergency incidents. A total fire ban is in place across the entire state today, with the fire danger rated extreme for the North Central, Northern Country and Mallee districts. The rating is severe for the Wimmera, South West, Central and West and South Gippsland regions, and very high in the East Gippsland and North East districts. “Friday’s a horrible day with a late change, with wind, with a landscape that’s been baking for a number of weeks now,” CFA operations manager Paul King said. Firefighters urged residents to avoid activities like angle grinding and slashing. Authorities were also concerned careless visitors over the Australia Day long weekend could put extra pressure on fire crews, with concerns around campfires and fireworks. “We’ve really hit a critical point in the bushfire season,” said Aaron Kennedy, the Department of Environment, Land, Water and Planning’s assistant chief fire officer for the Hume Region. “So we’re really asking people to be vigilant, particularly if they’re in our forests or on the river this Australia Day weekend.